I've tried the new update, I've tried not using the new update, I've tried re-plugging in all of the cables, I've tried using a different USB port. I've Used Roxio And It's Worked Before, But It Just Randomly Started To Do This. PLEASE HELP! I Just Did The Revo Uninstaller Thing, Then Re-Isntalled, And Now The Program Wont Open. PLEASE HELP! I Already Know My Computer Meets The Minimum Spec... I've Ran It Before. And I Currently Don't Have An Anti-Virus It Just Ran Out And My Dad Is Working On Getting Me New Anti-Virus. So it ran before? I don't think you mentioned that earlier. No anti-virus? Were you connected to the Internet? How do you know you haven't been infected. Don't waste $$ paying for a anti-virus. Windows Security Essentials is free and workedks as good as anythign else. Now think back. other than MS updates did you add any new programs or updated existing programs? When you used Revo in the Moderate Mode, did you allow it to remove the registry entries and folders? You should have in order to get everything off your computer for a clean install. What you posted was NOT the dxdiag that I asked for. That gives driver information wich is very helpful. Please, I know you are frustrated but unless you slow down and answer the questions and provide the information then things will never be answered to your satisfaction. No anti-virus? - Correct. Were you connected to the Internet? - Yes. How do you know you haven't been infected. - I didnt download anything except roxio software since it had ran out. And I used the anti-virus thing that is already on my laptop for free. (What You Said Next, Windows Security Essentials) Don't waste $$ paying for a anti-virus. Windows Security Essentials is free and workedks as good as anything else. When you used Revo in the Moderate Mode, did you allow it to remove the registry entries and folders? You should have in order to get everything off your computer for a clean install. - Yes I Did. What you posted was NOT the dxdiag that I asked for. That gives driver information wich is very helpful. - Sorry. I'll Do The Drivers And Attach It To This Reply. 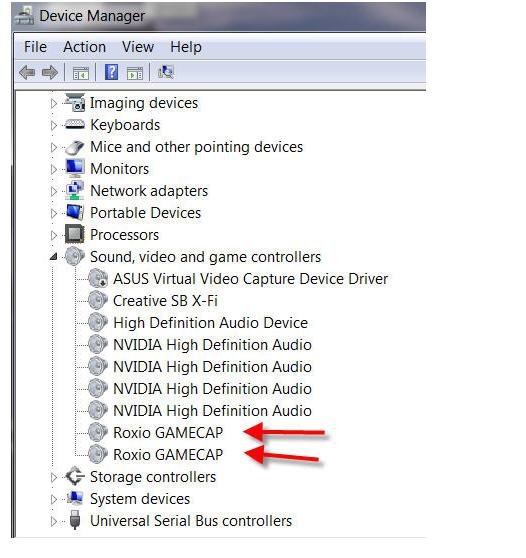 See the little triangle next to one of the Roxio GAMECAP listing. It means that something is wrong with that driver installation. Right click on it and see what it says. You may have to do a repair. Make sure the device is plugged in, right click on those drivers to uninstall them. Remove the device. Reboot and then do a repair of the software and then plug the device back in. Can you remember what may have happened to cause the issue with the driver/capture device? You had a couple of folks bending over backwards to help you, so it would be proper if you told them what you did to get it working, instead of the d-ork post that you made. 3rd.) Downloaded Roxio with msconfig and disabled all.